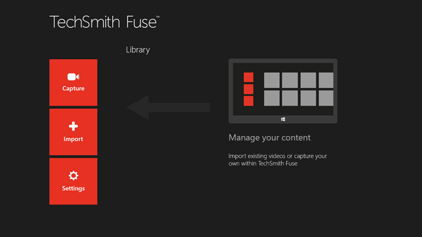 TechSmith Fuse is a mobile app that allows you to send images and videos from your mobile devices directly to Camtasia. 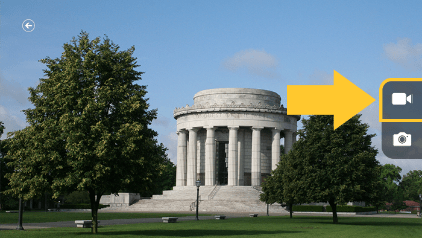 It is available for iOS, Android, and Windows devices. 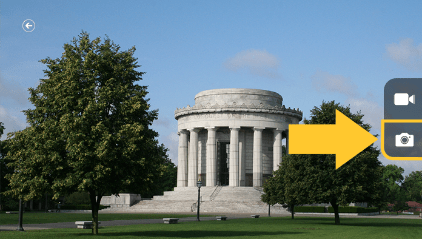 This tutorial is intended for users who have Windows tablets. TechSmith Fuse is not currently available for Windows phones. 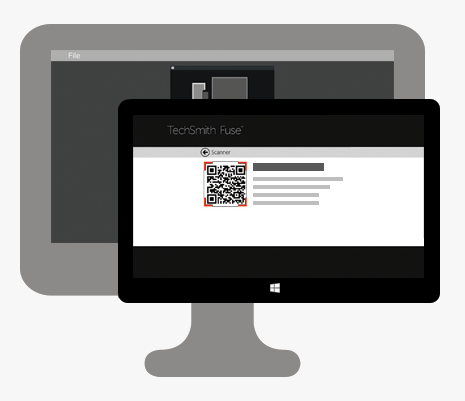 If you haven't already, download TechSmith Fuse from the Windows Store. 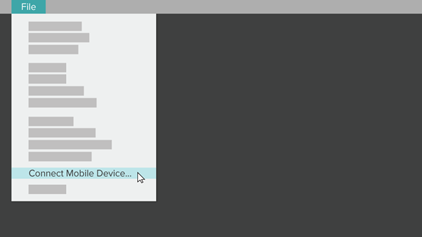 Once the app is installed on your Windows device, go to the Start screen and tap TechSmith Fuse. The application opens to the Library, which is empty at first. 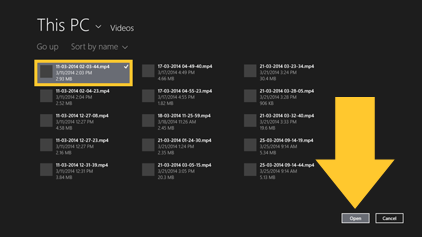 To add content to the Library, capture a new image or video, or import existing media from your device. From the Library, tap Capture. The first time you tap Capture, the application will ask to use your webcam and microphone. 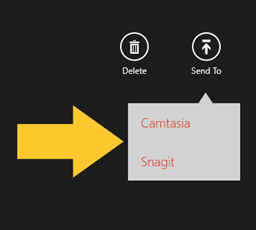 To enable sharing between Fuse and Camtasia, tap Allow. To begin recording a video, tap the video camera icon. When you are finished recording, tap the checkmark to save the recording to your Library, or tap X to discard it. To take a photo, tap the camera icon. The image is automatically saved to the Library. Tap the Back button to return to the Library. From the Library, tap Import. 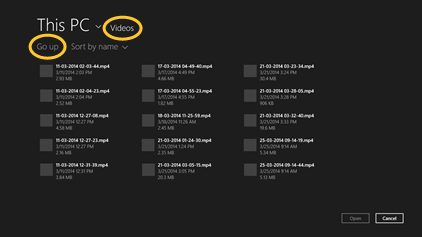 The application opens to your Videos folder by default. To select a different folder, tap Go up and navigate through the folder structure until you find the one you need. Tap the file you want to import, and then tap Open. The file you selected is added to the Library. Make sure your computer and Windows device are connected to the same network. 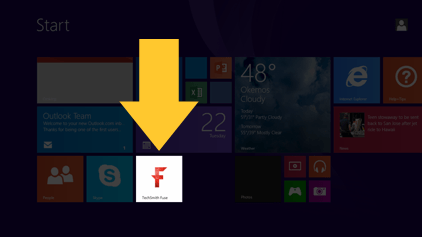 If TechSmith Fuse is not open on your Windows device, launch the application. 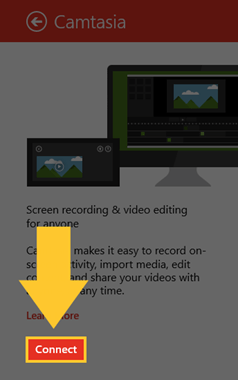 From the Library, tap the image or video you want to send to Camtasia. Tap Send To > Camtasia. Using your computer, open Camtasia and click File > Connect Mobile Device. 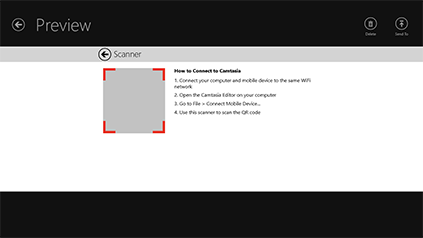 Pick up your Windows device and point the Scanner in Fuse at the QR code in the dialog displayed on your computer screen. 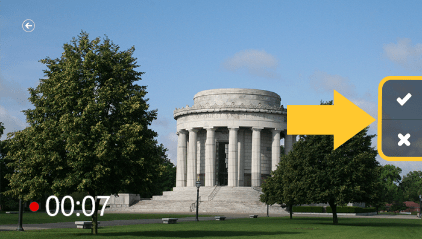 Once the Scanner reads the QR code, the image or video you selected is sent to the media bin in Camtasia.